Although home to all sorts of wonderful attractions, the coastline of North Carolina is loved mostly fort its protected wilderness, ensuring that vast swathes of the coast remain pristine and untouched. 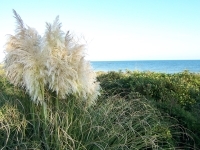 It has always lured nature lovers seeking peace and relaxation. Apart from the protected enclaves of the Cape Hatteras National Seashore and Cape Lookout National Seashore, coastal state parks in North Carolina include Jockey's Ridge, Fort Macon, Hammocks Beach, Carolina Beach, and Fort Fisher. The coastline is honeycombed with islands, lagoons and estuaries, creating a natural playground for water sports and activities like birdwatching, hiking, or simply lounging on the shores. 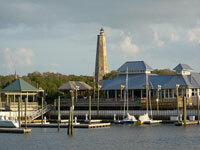 Popular islands along the coast include Bodie Island, Hetteras Island, Ocracoke Island, and Roanoke Island. The main urban travel hubs of the region are Wilmington, a charming laidback city with many historic buildings, and New Bern, a small city located at the confluence of the rivers Trent and Neuse. However, most visitors choose to spend time in the small villages and resorts of North Carolina.